…and they make it look good. The much-anticipated (well, anticipated for me at least, I <3 everything Homeworld) Soban Fleet Pack DLC for Homeworld: Deserts of Kharak is live today! I had a lot of fun playing with the new units, and love the new skins and unit abilities. Microwave Emitter – a new top tier weapon that will deploy deadly microwave radiation to a targeted area, damaging any enemy units while they’re in the AOE field. Armed Logistics Modules – Soban armed logistics modules have a short-range defense system that slows and damages nearby enemies. Additionally, the Soban Carrier can redirect power to increase launch distance, rate-of-fire, and damage capability of these modules. Defensive Railguns – The Soban Carrier does not use smaller calibre point-defense cannons. Instead, they have railguns for defense. I love the new carrier! The railguns are a blast (heh heh…pun intended of course) and the Kiith Soban emblem on the runway is just tasteful. Soban’s commander also sounds terse and competent. I can’t bank on it, but it seems like the carrier’s railguns hit harder than the standard cannons. Someone let me know if there’s a DPS difference in the comments? The microwave emitter ability is great against annoying LAV swarms, too. Multi-Phase Railgun Turrets – Soban Battlecruisers have been outfitted with dual railgun turrets in place of standard cannons. This is my favorite unit of the DLC, apart from the super tasteful skins. Soban Battlecruiser railguns two-shot medium armor vehicles! I also love watching the vehicle animation during combat: normally the railguns are in ‘rest’ positions on top of the vehicle, but during combat they’re rotating and tracking targets. I love the attention to detail in this franchise! Targeting Jammer – A new ability that allows Soban baserunners to disable weapons in a target area. She’s pretty, isn’t she? I love the white slash and the “this ain’t my first rodeo” weathering. The jamming ability is really nice versus artillery and bombers! Mark Target Ability – Soban Railguns can paint a target within range, helping friendly units to do more damage while the mark is active. I think the Soban Railgun has the largest implications on multiplayer of the entire DLC, due to it’s Mark Target ability. While the ability is active (thankfully it can only be activated for 15 seconds at a time, preventing it from being broken level good) the unit fires a targeting laser rather than the railgun at a target, causing the target to take up to 26% additional damage. This is nuts, especially when targeting an enemy carrier! I feel that this is a very powerful ability, but we’ll have to see whether it has any dramatic impacts on multiplayer or not. I know that there are mixed opinions on DLC, but personally, I’m a huge fan – as long as the game itself was great to begin with, and the DLC isn’t a bugfix-that-costs-money. Thankfully, DoK is a very solid game in it’s own right and this DLC is definitely not required to enjoy the original title. It is fun if you play skirmish mode and want extra variety and eye candy, although it doesn’t impact the single player aspect of the game at all as far as I am aware. 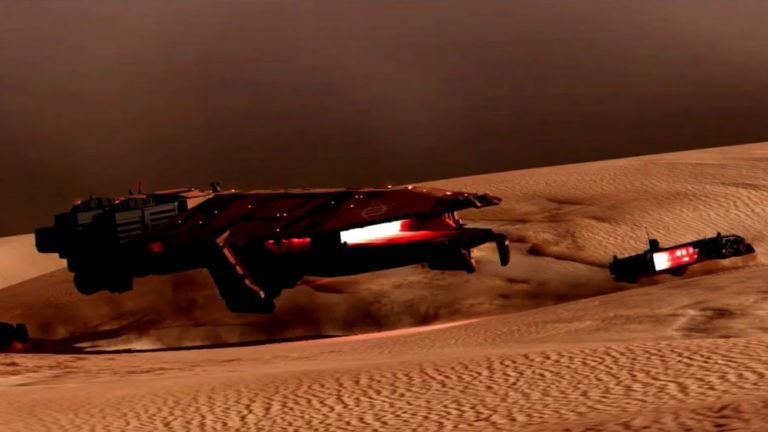 I’m very happy that Gearbox and Blackbird seem dedicated to supporting the Homeworld franchise (both Remastered and Deserts of Kharak) and I’d love to see more DLC for both titles. Personally, I’d prefer DLC with emphasis on single player storyline or art (thanks for the DoK Expedition Guide, BBI! ), but I’m happy for any/all DLC. Now, go check out the Soban Fleet Pack on steam!